Hardcover - 160 pages - The De Havilland Tiger Moth biplane is an iconic and instantly recognisable aircraft with a distinctive silhouette that perfectly matches its name. It is also one of a handful of planes that attracts the widest possible recognition outside the specialist group. The tough, fabric-covered airframe and robust Gipsy Major engine are both proof that good design can stand the test of time. Of around 8,600 Tiger Moths built between 1931 and 1945, over 1,000 survive today. Of these, around 650 remain airworthy - a truly remarkable survival rate. 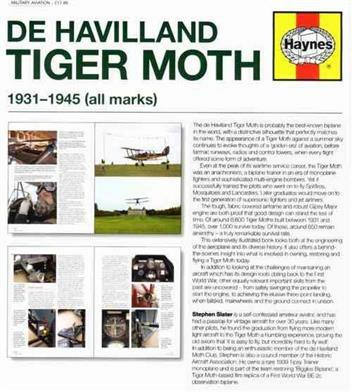 De Havilland Tiger Moth 1931 - 1945 (All Marks) Haynes Owners Workshop Manual is a extensively illustrated book looks both at the engineering of the aeroplane and its diverse history. 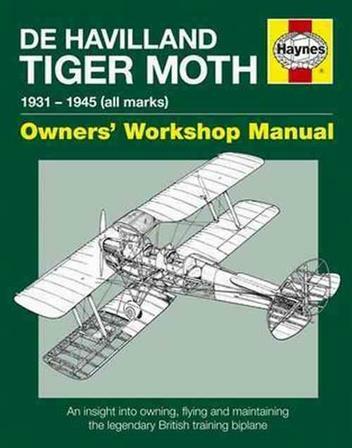 It also offers a behind-the-scenes insight into what is involved in owning, restoring and flying a Tiger Moth today. Contents: * Introduction * The Tiger Moth Story * Anatomy of the Tiger Moth * The Owner's View * The Pilot's View * The Engineer's View * Epilogue * Appendices * Index In addition to looking at the challenges of maintaining an aircraft which has its design roots dating back to the First World War, other equally relevant important skills from the past are uncovered - from safely swinging the propeller to start the engine, to achieving the elusive three-point landing, when tailskid, mainwheels and the ground connect in unison. Colour & b/w illustrations.